Thursday 24th April at 6.15pm for 7.00pm. 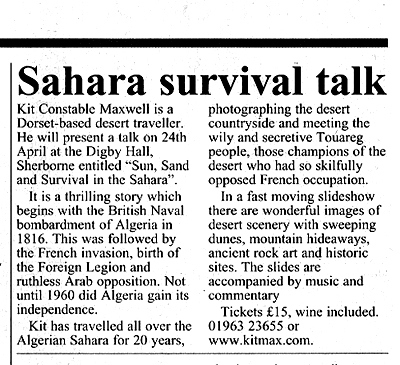 Dorset photographer and military historian Kit Constable Maxwell will be giving an illustrated talk on ‘Sun, Sand and Survival in the Sahara’ in the Digby Hall, Hound Street, Sherborne. Kit has had a lifelong interest in desert travel. and has driven his own Land Rover across Libya, Algeria, Morocco, Tunis, Tibet, Nepal and India. Recently he travelled into the Sahara to explore the Touareg homelands in the Hoggar Mountains. This talk will show slides of some of the most remote and inaccessible parts of our planet. His slide sequence shows unseen pictures of desert landscapes and rock art. The fast moving show is accompanied by music and commentary. June 2013 - Photo safari in North East Portugal. For other trips, expeditions and challenges, click the box below. "My Life on Wheels, the Land Rover way"
knowledge and experience about some far-flung destinations." Kit's sheer zest for travel, challenge and life in general". last year It was a grand success with over 100 guests. Thank you for all your enthusiastic reponses. of the Long Range Desert Group in 1941. Other lectures are in the course of preparation. Please make contact for details.